It has been an interesting summer, with me and my wife enjoying our first summer in Easthampton. The majority of the summer has been spent preparing for (drumroll) the birth of our son in October! Fitting around the preparation I have been working on two new projects. The first is a piece for four iPads. The performance software is written in Pure Data (Pd) and then hosted via the iOS app MobMuPlat. This has allowed me to explore developing applications for iOS (helped in part from a TLTR Grant from Ramapo College). I have always enjoyed working in Pd alongside Max, and there are aspects I prefer in Pd (Graph-on-Parent, FOSS, for example), while other aspects I prefer in Max (help, grid patching, patch cord routing, gen~). My plan from here on out will include dividing my time between the two, with iOS development in Pd, most teaching in Pd (it is free after all), while personal performance tools will likely be developed in Max, usually hosted in Ableton Live via Max-For-Live, and teaching of synthesis will be conducted using BEAP in Max/Max-For-Live. The second project I have started to develop is in some ways an extension of the planned composition I applied for funding through the ECA+ E.A.T. program. I don’t have the time (or funding) to develop the intended string quartet, between to the research needed to investigate folk music and develop those melodies into a modern texture, the part writing, and the electronic processing development. So I have decided to develop an hour+ solo performance of folk music presented through the eye of an electroacoustic composer. This will involve pieces performed myself on electronics, guitar, harmonic, and vocals. The major difference between the string quartet material and this “Folk Revue”, is that the works selected for the revue will be more reflective of my own path through folk music; its far from comprehensive, and probably is slanted a bit too much towards early 60s Greenwich Village folk than an a presentation of folk musics from many cultures and nations. This project is being worked out in Max and then hosted in Ableton Live (it just makes a lot of things much easier than “pure” Max). Many of the algorithms I’m developing either help me in performing solo, are generative and develop musical ideas automatically, or are interactive and respond to my performances. I hope to perform it somewhere around Easthampton over the next few months, ideally before my little homie is born! Well, unfortunately I did not get selected as the recipient of the Easthampton Arts Treasury Grant through the Easthampton City Arts+ council. It was a bit of an uphill battle for me, as I am new resident of Easthampton, and I was also on the younger side of both the applicants and the attendees. Be that as it may I felt the whole evening was a great success and I am proud of the piece I performed during the presentations, a heavily processed improvisation on Woody Guthrie’s “Pretty Boy Floyd” and I still plan to write the string trio with electric guitar in which I was seeking funding for. I also hope this was the first event of many that I participate in with the Easthampton City Arts+ group! 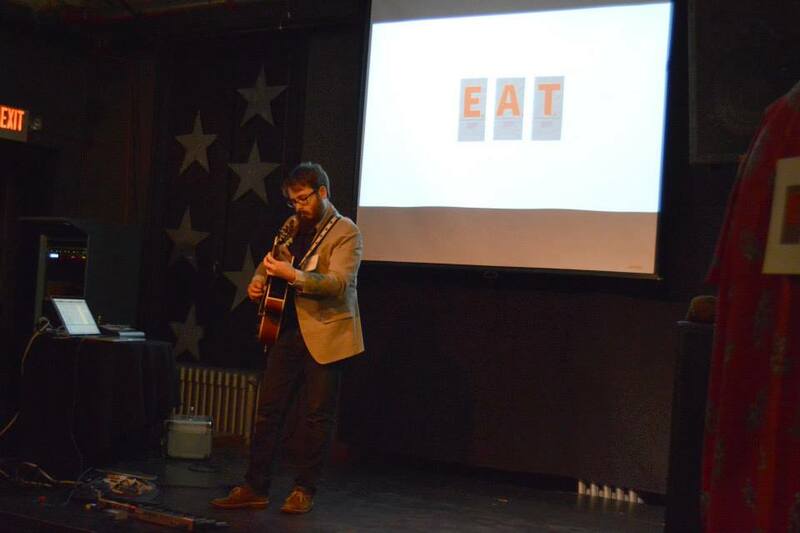 I have been selected as a presenter and potential recipient of crowd-sourced funds through the Easthampton City Arts’ EAT (Easthampton Arts Treasury) program. On March 26th from 7-9 PM at Flywheel Arts Collective in Easthampton, MA, myself along with other selected applicants will present their projects in which they are seeking funding. A $25 donation at the door gets you into the event where there will be food and drink. After presentations, event-goers vote on the applicant they think should receive the funding, and the winner receives all the money collected at the door, plus an additional $100 dollars from the Easthampton City Arts+. I am seeking funding to compose an electroacoustic work for string trio (violin, viola and cello) along with electric guitar, which will call upon modern harmony, digital signal processing, and folk music themes. The more of my friends and supporters that go will provide more money at the door for the selected applicant… and hopefully, as friends and supporters you will lean more towards my project! More information can be found at the EAT Facebook page. Tickets are selling fast, and seating is limited, so please reserve your tickets soon! Tickets can be reserved at Eventbrite. An amazing experimental film directed by Loretta Fahrenholz, produced by Inka Meissner, and based upon a play by Kathy Acker that I engineered the sound for as well as did sound design and post-production sound for is having its American & New York City premier this Saturday night, November 19th, Midnight, at the Reena Spaulings Fine Art Gallery in Manhattan, 165 East Broadway. This should be a fantastic event, with members of the cast and crew in attendance. Click on the image above for more information, or go to http://reenaspaulings.com/. The internet is just an incredibly wonderful place. It’s just over-abundant with information, and opportunity to gain new knowledge. I’ve been adamantly following the exploits of Ubu Web, a repository for the avant-garde. They also have absolutely roped me back into the Twitter-verse; their Twitter account posts the most informative and interesting bits of media, text, audio, video that is encompassed by the HUGE umbrella of the avant-garde (much farther reaching than you’d expect… I’d like to think that I’m an apt example of in my own tastes). Please do yourself a favor and check out Ubu Web at ubu.com, and their twitter @ubuweb. Lastly, the reason which prompted this post: a very interesting article on internet music and its results, written by Ubu Web founder Kenneth Goldsmith. He has seemed to hit the nail on the head when it comes to the new shift in music as a commodity and listening patterns that have resulted in the internet mp3 boom. I’m right there with him. I used to be a record collecting junkie. Couldn’t get enough. But then I had a bit more of a disposable income (the joys of living with your parents). I can’t tell you the last time I bought an album. It was likely because I couldn’t download it. But with this freedom, I feel like I have not only been exposed to more music but have become a BIGGER music fan. Which IMO is much more important. That being said, please download my music as much as you please; sample it, repurpose it, enjoy it, it’s yours. 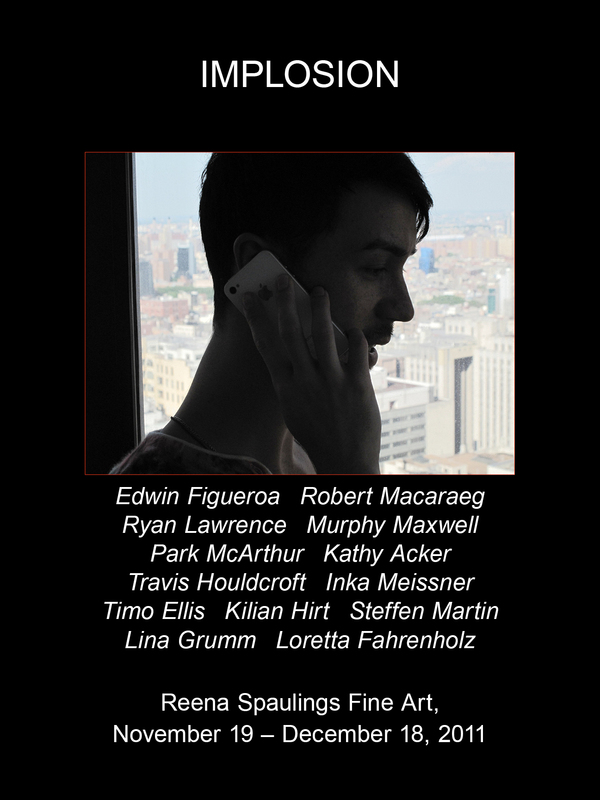 On Saturday April 02 from 2-4 PM I will be performing two new works-in-progress at the Eyebeam Art+Technology Center as a culmination of the Sound Art class I helped teach for two classes, where members of the class will exhibit their works in an open collaborative gallery environment. See the PERFORMANCE page for more information.